Wow, what a blast from the past that was. 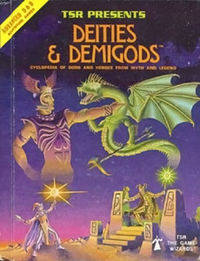 AD&D, Gary Gygax, the whole experience was my ’70s childhood. Thanks for the reminder. Fond memories for those days myself. Happy to share them. I played that before it was ‘popular’. …and I played it after it stopped being popular. Together, we got this! Once while crossing over into Canada I got pulled over by the border guards who wanted to search the trunk. For some reason I couldn’t recall, I had some D&D books that belonged to a friend in there. The guards spent a really long time examining the books and asking questions. I seriously thought they weren’t going to let us through with them. It was really weird. Okay now, that really is bizarre. I still remember the Satanic panics of the eighties. You never know how some people can interpret this stuff. LOL, alignment check for that one! Had an atonement mission in the next game, yes we did. Now that is how you DM a good game! Inspiratio happens. …course the follow-up campaign was learning where the sword came from, and just whose hand had been found grasping it.